Cautionary tales about roping, tackling or petting a deer. This story on deer roping was forwarded to me via e-mail. The writer obviously wants to remain anonymous. To my knowledge this incident did not happen on Glade Park. It is included as a cautionary and highly entertaining tale. I filled the cattle feeder then hid down at the end with my rope. The cattle, who had seen the roping thing before, stayed well back. They were not having any of it. After about 20 minutes my deer showed up - 3 of them. I picked out a likely looking one, stepped out from the end of the feeder, and threw my rope. The deer just stood there and stared at me. I wrapped the rope around my waist and twisted the end so I would have a good hold. The deer still just stood and stared at me, but you could tell it was mildly concerned about the whole rope situation. I took a step towards it...it took a step away. I put a little tension on the rope and received an education. The first thing that I learned is that while a deer may just stand there looking at you funny while you rope it, they are spurred to action when you start pulling on that rope. That deer EXPLODED. The second thing I learned is that pound for pound, a deer is a LOT stronger than a cow or a colt. A cow or a colt in that weight range I could fight down with a rope with some dignity. A deer, no chance. That thing ran and bucked and twisted and pulled. There was no controlling it and certainly no getting close to it! As it jerked me off my feet and started dragging me across the ground, it occurred to me that having a deer on a rope was not nearly as good an idea as I originally imagined. The only up side is that they do not have as much stamina as many animals. A brief 10 minutes later, it was tired and not nearly as quick to jerk me off my feet and drag me when I managed to get up. It took me a few minutes to realize this, since I was mostly blinded by the blood flowing out of the big gash in my head. At that point I had lost my taste for corn fed venison. I just wanted to get that devil creature off the end of that rope. I figured if I just let it go with the rope hanging around its neck, it would likely die slow and painfully somewhere. At the time, there was no love at all between me and that deer. At that moment, I hated the thing and I would venture a guess that the feeling was mutual. Despite the gash in my head and the several large knots where I had cleverly arrested the deer's momentum by bracing my head against various large rocks as it dragged me across the ground, I could still think clearly enough to recognize that there was a small chance that I shared some tiny amount of responsibility for the situation we were in. I didn't want the deer to have to suffer a slow death so I managed to get it lined back up in between my truck and the feeder - a little trap I had set before hand. Kind of like a squeeze chute. I got it to back in there and started moving up so I could get my rope back. Did you know that deer bite? They do! I never in a million years would have thought that a deer would bite somebody so I was very surprised when I reached up there to grab that rope and the deer grabbed hold of my wrist. Now, when a deer bites you, it is not like being bit by a horse where they just bite you and then let go. A deer bites you and shakes its head - almost like a pit bull. They bite HARD and it hurts. The proper thing to do when a deer bites you is probably to freeze and draw back slowly. I tried screaming and shaking instead. My method was ineffective. It seems like the deer was biting and shaking for several minutes, but it was likely only several seconds. I, being smarter than a deer (though you may be questioning that claim by now) tricked it. While I kept it busy tearing the stuffing out of my right arm, I reached up with my left hand and pulled that rope loose. That was when I got my final lesson in deer behavior for the day. Deer will strike at you with their front feet. They rear right up on their back feet and strike right about head and shoulder level, and their hooves are surprisingly sharp. I learned a long time ago that when an animal like a horse strikes at you with their hooves and you can't get away easily, the best thing to do is try to make a loud noise and make an aggressive move towards the animal. This will usually cause them to back down a bit so you can escape. This was not a horse. This was a deer, so obviously such trickery would not work. In the course of a millisecond, I devised a different strategy. I screamed like a woman and tried to turn and run. The reason I had always been told NOT to try to turn and run from a horse that paws at you is that there is a good chance that it will hit you in the back of the head. Deer may not be so different from horses after all, besides being twice as strong and three times as evil, because the second I turned to run, it hit me right in the back of the head and knocked me down. Now when a deer paws at you and knocks you down it does not immediately leave. I suspect it does not recognize that the danger has passed. What they do instead is paw your back and jump up and down on you while you are laying there crying like a little girl and covering your head. I finally managed to crawl under the truck and the deer went away. Now for the local legend. I was pretty beat up. My scalp was split open, I had several large goose eggs, my wrist was bleeding pretty good and felt broken (it turned out to be just badly bruised) and my back was bleeding in a few places, though my insulated canvas jacket had protected me from most of the worst of it. I drove to the nearest place, which was the Co-Op. I got out of the truck, covered in blood and dust and looking like hell. The guy who ran the place saw me through the window and came running out yelling, "What happened?" I have never seen any law in the state of Kansas that would prohibit an individual from roping a deer. I suspect that this is an area that they have overlooked entirely. Knowing, as I do, the lengths to which law enforcement personnel will go to exercise their power, I was concerned that they may find a way to twist the existing laws to paint my actions as criminal. I swear...not wanting to admit that I had done something monumentally stupid played no part in my response. I told him "I was attacked by a deer". I did not mention that at the time I had a rope on it. The evidence was all over my body. Deer prints on the back of my jacket where it had stomped all over me and a large deer print on my face where it had struck me there. I asked him to call somebody to come get me. I didn't think I could make it home on my own. He did. Later that afternoon, a game warden showed up at my house and wanted to know about the deer attack. Surprisingly, deer attacks are a rare thing and wildlife and parks was interested in the event. I tried to describe the attack as completely and accurately as I could. I was filling the grain hopper and this deer came out of nowhere and just started kicking the hell out of me and BIT me. It was obviously rabid or insane or something. EVERYBODY for miles around knows about the deer attack (the guy at the Co-Op has a big mouth). 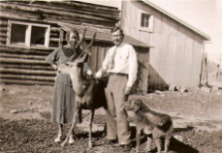 For several weeks people dragged their kids in the house when they saw deer around and the local ranchers carried rifles when they filled their feeders. I have told several people the story, but NEVER anybody around here. I have to see these people every day and as an outsider - a "city folk". I have enough trouble fitting in without them snickering behind my back and whispering, "There is the dumbutt that tried to rope the deer!" If you do not believe this is a true story, go to YouTube and search for "deer attacks."